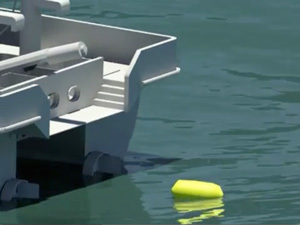 As a result of industry surveys the Ocean Cleaner Technology team has always worked under the premise that the OC-Tech should not only be suitable for the efficient recovery of hydrocarbon spills but must also have capability in other clean-up applications, making it a useful tool in the best-practice management of sea, port and coastal environments. OC-Tech offers new, patented technology with three key and unique aspects: The ability to generate and precisely control a flow between the two catamaran hulls; a self regulating collection system, which can separate both solids and types of liquid and a unique polyethylene bagging system enabling recovered spill or other contaminants to be stored safely until subsequent removal for processing and treatment. The catamaran hulls and propulsion system give OC-Tech exceptional operating flexibility, allowing it to engage efficiently in a wide range of situations, including confined spaces, in shallow waters or close inshore. The OC-Tech is a shallow-draft catamaran with two main propulsion units at the rear of each hull and auxiliary thruster units located in each of the bows. 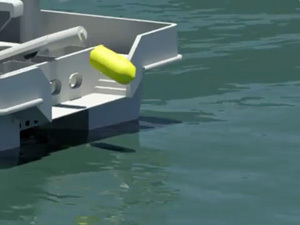 The bow units allow the OC-Tech to generate and control a water flow between the two hulls, even while stationary, offering advanced collection possibilities. The four propulsion units give OC-Tech very precise manoeuvrability. The breadth of situations OC-Tech can be applied to include anything from holding a static position alongside a ship leaking contaminant to clean-up of confined and difficult areas in ports, close inshore, on rivers and on dams. This versatility allows for novel but simplified action plans for OC-Tech users. The collection system can grade and separate solids from liquids according to application requirements. Liquids can then be further separated, through decantation, resulting in a high hydrocarbon separation rate, while avoiding emulsions. The separated liquids can then be stored or, if necessary, bagged during operation. The unique OC-Tech polyethylene bagging system means that spill and solid contaminants can be contained safely during OC-Tech operation. Both liquids and solids can be stored in these large floating bags, which once filled are sealed, marked with a buoy and released back into the water for subsequent collection. 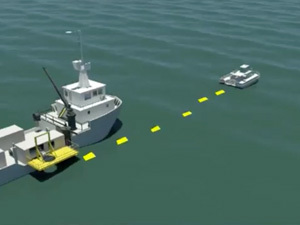 The bags can be towed away by an unspecialized auxiliary vessel, even a small boat, to port or to the shore for removal and treatment. The OC-Tech is able to simultaneously collect and bag both solids and liquids. For hydrocarbon spills of 1mm thickness and using the bagging system, the OC-Tech is able to collect and bag at a rate of 15MT per hour, so potentially +300MT per day. Each bag holds 2MT. For small spills and quantities of solids the OC-Tech’s onboard tanks can be used for storage and later safely unloaded in port. 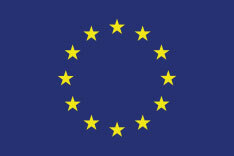 This capacity allows MARPOL services to be offered to third parties. The bagging system permits OC-Tech to operate continuously for up to 48 hours as there is no need to transfer collected spill or solids to support vessels or return to port for offloading. Typically OC-Tech operates at 3 knots in open water.